Learn how to cut to perfect margins and create beautiful conservative tooth preparations. This course allows you to offer indirect restorations other than crowns and avoid excessive post and crown fractures, and restore an endodontically treated tooth or the best post-core system. You may also improve your lab communication, crown fittings and avoid short margins. Our goal is to help you make fixed prosthodontic procedures faster, easier and more predictable. This popular hands on course will enhance your knowledge on fast preparations, best build-up techniques, strongest and fastest posts and cores and getting the most from your cement as well as obtaining an optimum treatment plan of acceptance. 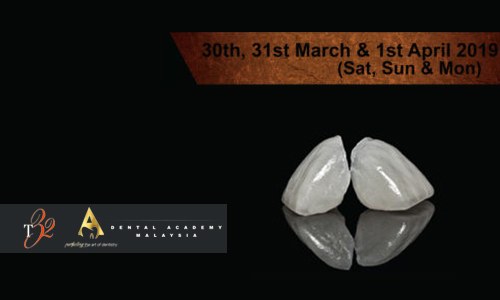 You will be able to perform the best prostheses with long term predictable outcome upon completion of this course. Post and core – when to do? Dental Academy Malaysia reserves the right to cancel, postpone or modify the announced course content, limit enrollment, or change the location, time, date, or speakers due to unforeseen circumstances. A full refund of course fee will be issued if the Dental Academy Malaysia cancel or postpone of any courses. No refunds will be issued if you cancel the course registration. Dr Karthikeyan graduated in Dental Surgery from Maenakshi Ammal Dental Colege at “The Dr. Mgr Medical University” India in 2004. He later continued his studies at the Dental Institute in King’s College London where he received his Master’s in Clinical Dentistry in Fixed and Removable Prosthodontics. He trained under leading Aesthetic and Prosthodontic Rehabilitation Specialists like Dr Mauro Fradeani, Dr Galip Gruel, Prof Brian Millar, Dr Christian Coachman and Dr Mario Basek. He is a Senior Clinical Lecturer and Specialist Prosthodontist at the Dental Faculty at Lincoln University College. He is also a Member of the European Prosthodontic Association.